So whether you’re a TV or corporate producer looking for an experienced and totally professional scriptwriter, or a teacher in search of someone who can dramatically improve your students’ writing abilities, then I hope you find something to interest you. If you’re merely looking around because you’ve got nothing better to do at the moment … well, thanks for dropping by. I’ve earned my living exclusively from writing since the age of 18 (and that was a long time ago!). I began as a junior reporter on my local evening newspaper, graduated to writing for national newspapers and local radio stations as a Press Agency news and sports reporter, then moved into television as a Promotions Scriptwriter and subsequently Promotions Producer. 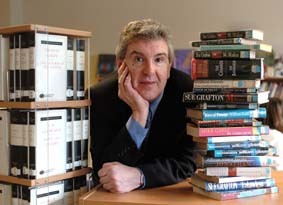 I became a freelance writer in 1979, since when I have notched up over 2000 TV credits as writer, script editor and programme associate for ITV, BBC, Channel 4, Five, Sky One and RTE, working in just about every genre known to television. I wrote my first corporate script back in 1982 and have continued to work in that area ever since, writing for some of the world's biggest companies. And since 1992 I have been devising and running Creative Writing workshops for students of all ages. I am a full member of the Writers’ Guild of Great Britain www.writersguild.org.uk and the National Association of Writers in Education www.nawe.co.uk. The success of my writing workshops led to me being commissioned by Routledge to write a handbook for teachers, showing innovative and effective ways of teaching essential writing skills. 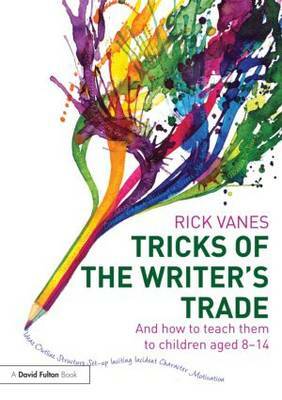 Entitled Tricks of the Writer's Trade - and how to teach them to children aged 8-14, it was published in November 2011. It covers both fiction and non-fiction, deals with topics such as story structure, writing techniques, creating characters, how to get story ideas, journalistic writing, persuasive writing, scriptwriting and more, and contains lots of the resources which I use in my workshops. In fact, anyone of any age who wishes to improve their writing skills and learn some of the techniques that professional writers use will find the book an invaluable guide. You can find out more about it on the Routledge website by clicking here». Or if you wish to buy a copy from Amazon, you can do so here». You’ll find fuller details of all the things I’ve done and what I have to offer elsewhere on this site, but if you’d like to know more, or have any questions, then please don’t hesitate to get in touch.